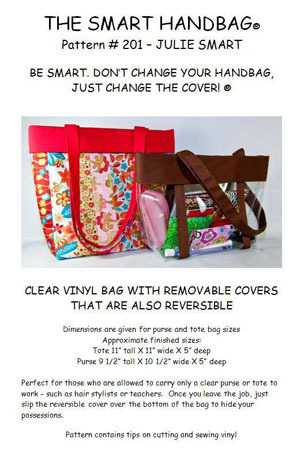 1/2 yard vinyl for the bag - 16 or 20 gauge. If the gauge is not specified, get the thickest you can find. Most fabric stores carry this as a tablecloth protector. 3/4 yard fabric for the cuff, handles, and channels. Medium weight, home-dec type fabrics such as twill or denim are recommended. Thread to match the above fabric. Optional - 1 1/3 yard light weight fusible interfacing if using quilt weight cotton for the cuff. 6 inches hook and loop tape (Velcro). Polyester boning (1/2 inch wide) - 1 yard for the purse size bag, or 1 1/4 yard for the tote. Optional, but very nice to have: Sew-Slip (this is a non-stick sheet that is put on the bed of your sewing machine during free-motion quilting to help the quilt slide better). We won't be doing free-motion sewing, but this will help the vinyl not stick to the sewing machine.